When it comes to planning a date night Simon and I are very much stuck in a rut. We put in little effort organising our evenings out and you'll usually find us stuffing our faces in a restaurant or tucked away in the cinema watching the latest Blockbuster. 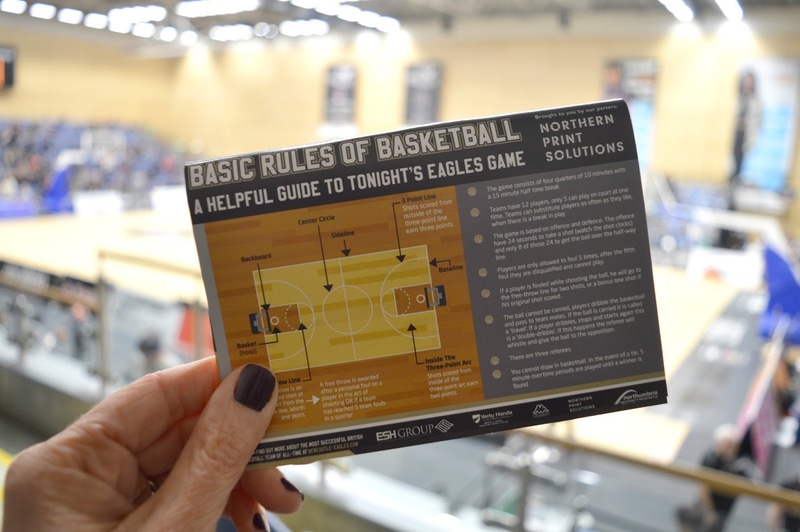 Last Friday however, Northern Print Solutions invited us to be their guests at a Newcastle Eagles basketball match and we found ourselves on a date night with a difference. Before I share our evening with you I should point out that I know nothing about basketball! Other than what I've seen in cheesy American high school movies and the little I picked up in PE, I'm pretty much clueless when it comes to the sport, so I was interested to see if I'd enjoy watching the Newcastle Eagles and if I'd be able to follow what was happening. 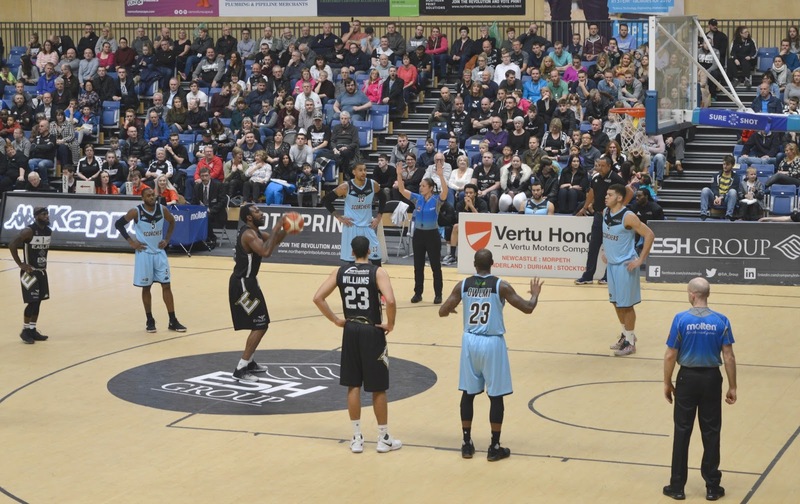 The Newcastle Eagles play at Sport Central at Northumbria University, a short walk away from the centre of Newcastle. I'm not sure what I was expecting but as we turned the corner and found Sport Central I was surprised at the amount of people queuing outside waiting for the doors to open. There were kids running about with basketballs, families kitted out in Eagles merchandise and die hard fans discussing their favourite players. Who knew basketball in Newcastle was such a big thing! We joined the crowds heading through the doors and collected our tickets before quickly finding the hot dogs, we were starving and every great date night has to start with food, am I right? We were expecting the hot dogs to be a little on the expensive side so were pleasantly surprised to discover that we could get a hot dog and a soft drink for £4.50 each. I smothered mine in ketchup and mustard and carefully climbed up the stairs with it to find our seats, hoping not to have a hot dog related accident! We were there to see the Eagles take on the Surry Scorchers in the BBL Championships! 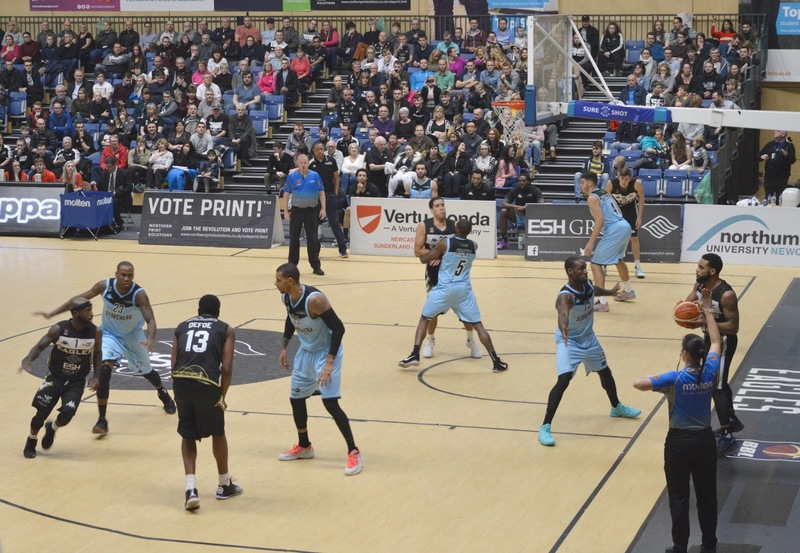 The Newcastle Eagles are the most successful British Basketball team of all time! Pretty impressive right? Definitely a reason to check out a game if you've never seen one before. The game started with each player individually being called out onto the court, with everyone in the crowd cheering for their favourite. We instantly decided that Nimley would be our favourite, smaller than the other Eagles players, he was super fast! We later realised, after a little look at the Newcastle Eagles website that he's actually 5 ft 8, he just looked small compared to the others. The match started in a flurry of mad excitement and we were 10 points ahead within the first few minutes with a very fast and thrilling start to the game. Despite not really understanding what was happening at the beginning I quickly got into my role of cheering on the Eagles and before we knew it we were fully engrossed in the action. Helpfully Northern Print Solutions had left a handy guide to the rules of basketball on each seat, perfect for beginners like us. Simon appreciated being able to wave the rules at me each time I tried to ask him a question. He was fully engrossed in the action and wasn't taking any interruptions from me! The atmosphere at Sport Central was electric with a very enthusiastic fan banging his drum during the most thrilling parts, choruses of "Let's Go Eagles" filling the stands and plenty of stamping feet and cheers. Simon and I aren't huge fans of football, mainly because we hate how aggressive the sport has become, there was such a great friendly atmosphere at the basketball - no swearing, no boos just plenty of good humour and handshakes. It was a joy to watch and even as complete newbies we felt very comfortable and welcome. The game is played in four 10 minute quarters, perfect for people like me with short attention spans! We loved the fun games and challenges every time there was a break including the Eaglettes cheerleaders, a kid's mini basketball game, a Mexican hat game and the much loved "Chuck a Duck" competition where kids flung little plastic ducks into the court to try and hit a target. Despite the Scorchers pulling back a few times the Eagles fought hard to secure a victory and as the time ticked down we began to realise that we might get over 100 points. 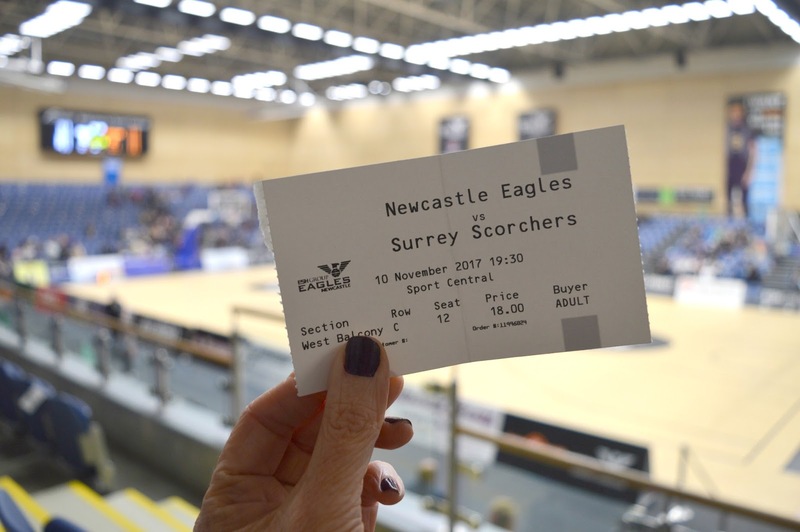 We were thrilled when the scores shot over the century and the final score was Newcastle Eagles 103, Surry Scorchers 80. What a victory! We both absolutely loved our evening at Sport Central and are very keen to return. 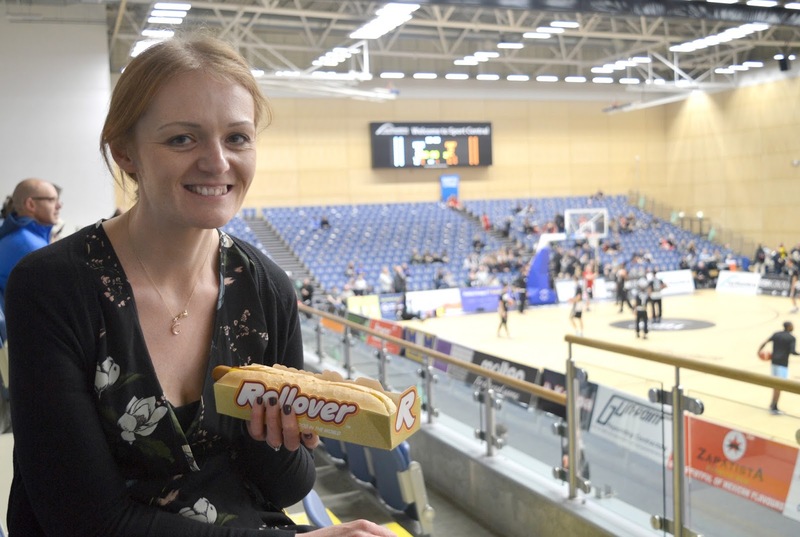 A date night at the Newcastle Eagles offered us a really fresh and different way to spend our evening and I could even see us getting season tickets in the future we loved it that much. 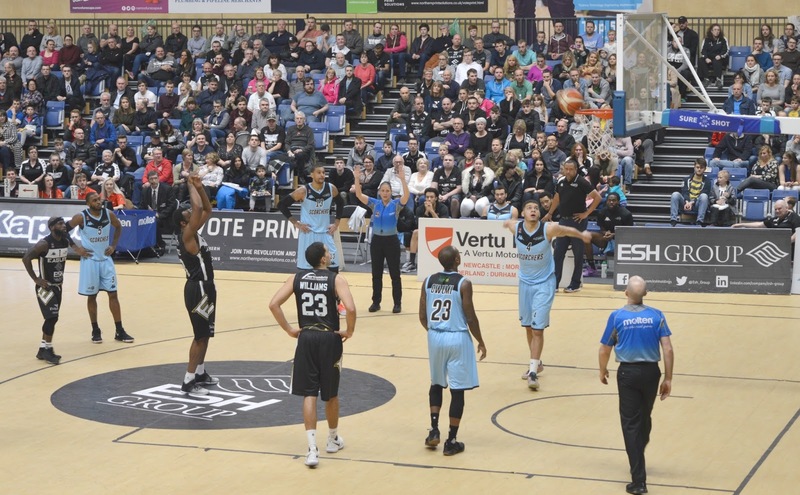 To find out more about the Newcastle Eagles and book your tickets, check out their website at newcastle-eagles.com - tickets cost £18.00 per adult and £10.00 per children and don't forget to check out Northern Print Solutions for high quality printing services right here in the North East! We were lucky guests of Northern Print Solutions and got complimentary tickets to the game in exchange for this honest review. It's good to read about a successful sports team in the north-east of England. I'm yet to see them play live, so thanks for suggesting this as a night out.